Last week I was invited to the first national meeting of farmer innovators in Bolivia. It included a fair and it was organized by Prolinnova and by World Neighbors. I was used to finding farmer innovations the hard way, one at a time, in the field, but here they were forty of them assembled under tents erected on a volleyball court in Cochabamba. Some of the farmers had worked with NGOs. A German NGO had coached a group of Guaraní women from the warm lowlands, the Chaco, to care for local maize varieties. Doña Lucía and the other women showed how they had learned to separate each native variety, to keep the fields separate so the pollen wouldn’t mix, to select ears for seed of pure red or striped gold, or pearly white or blue-and-yellow. The Guaraní wanted to preserve each variety because each one went with a different recipe of traditional food. The NGO taught them to dig into the soil to measure the moisture before planting. The women were still pleasantly surprised with this simple technique. It was helping them determine when the soil held enough water to bear a crop. The Swiss NGO Helvetas had helped a group of Aymara farmers from the High Plains to chart their weather for the year, meticulously recording the intensity of the sun, rain or hail. They called it a “Pachagrama” (an earth graph). The Aymara wise men, the yapuchiris, had gathered the eggs of wild birds (as they have done for many years) to predict the weather by the spots on the egg shells. Now, the yapuchiris compared the eggs with the pachagrama. After predicting the year’s weather, and then graphing it out, the yapuchiris were convinced that their predictions were accurate. Now there is a topic I wish I could study in detail. Maybe two cultures think better than one, but even the farmers with less NGO support were also creative, if less complicated. One farmer, Julián Prado, had carved two miniature mill stones from sandstone, perfect replicas of the old water-driven mill stones, but only about 40 cm in diameter. Instead of being driven by water and a turbine, don Julián could rotate the wooden shaft with his foot, and a system of gears and wheels turned the top stone. The wheat dropped into a hole in the middle of the upper stone, which whirled around grinding the grain to flour. Elena Céspedes had raised a dog as a puppy with her flock goats, even suckling on their milk. Now the dog would take the goats out alone into the sandstone hills to find rough pasture, freeing up doña Elena to do other things. Not all of the innovators were farmers. 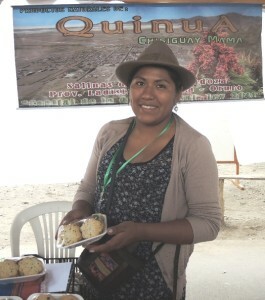 Raquel Alanes grew up in a small town, Salinas de Garci Mendoza, surrounded by quinoa fields. She had always liked to cook, and when she was a school girl she baked quinoa cookies and sold them at the local fairs. After high school she studied food manufacturing at university and improved her recipes. Bolivians have grown cacao and made chocolate for centuries, and Raquel had some chocolate quinoa Christmas cake (delicious) and quinoa chocolate-chip cookies and chocolate covered cookies made from the flour of chuño (Andean freeze-dried potatoes). 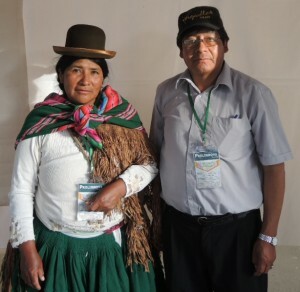 My favorites were Marina Mamani and Silvano Morales, an Aymara couple from the High Plains of the Andes. They had noticed that the price of native potatoes was rising, and was almost double that of commercial varieties. Some of the native varieties had nearly gone extinct. Doña Marina recalls one variety that she salvaged. It is bright yellow when cooked. Marina found just five of these potatoes left, in a basket at the home of her 90-year old mother-in-law. Marina planted them and got half an arroba (around 6 kg), which she planted again the next year, until she had enough to grow a field. That variety may well have gone extinct if Marina hadn’t found it in the basket. The couple has been growing heirloom potatoes for five years now, and they have enough of the red, purple, yellow and white potatoes to take to local fairs. Once in a while they go to the market on the wealthy, south side of La Paz, where the well-heeled are starting to appreciate these gorgeous varieties. “Next year we want to sell in the five-star hotels,” don Silvano says. The couple has a vision of the future. “What we really want is technical assistance,” Silvano added coyly. I fell for it, and gave him the name of an organization that worked in their area. Fresh ideas are nice, but sometimes a truck is even nicer. As I left, Silvano and Marina gave me some of their wonderful, rare potatoes. They were sprouting, and I could plant them in my garden. I’ll never be able to get these people a truck, but I can try and stay in touch with them, and see what happens next. “We should have a meeting of farmer innovators every year,” Silvano said. And that is a smashing idea. Creativity needs the warmth of other inventive people and the broader society to support those who put creative ideas into action.